Building your brewery’s brand takes more than just brewing beer and sending it to your distributor. Competition between small breweries is heating up, and it’s important to define your beer’s experience beyond the bottle. Attending and/or hosting craft beer events can expand your reach and increase your customer base. For the inside scoop on how to approach events, we picked the brains of Tim Raybould, chief executive officer of Ticketleap, and Tom Kehoe, president of the Philly-based Yards Brewing Co. Kehoe has used events such as their annual Real Ale Invitational and Smoke ‘Em If Yous Got ‘Em to engage with local beer enthusiasts and create a brand following, while Raybould and Ticketleap has helped numerous breweries and custom distilleries of all sizes – including Yards Brewing, Sierra Nevada and Dogfish Head – to cost effectively hold, organize and measure the impact of in-person events. Craft Brewing Business (CBB): How does supporting or hosting a local event benefit a brewery? Raybould: People love talking about beer that they love. As a craft brewer, without the marketing budget to buy Superbowl commercials every year, your business thrives on people loving your beer. For people to love your beer, they have to love your brand – who you are, what you stand for. Meeting someone face to face is the most effective way to make such a connection, and providing them with a great experience is even better. Events, of course, do this really well. Kehoe: Hosting an event at our brewery enables us to get involved in our local community, our craft brewing community and with our customers. 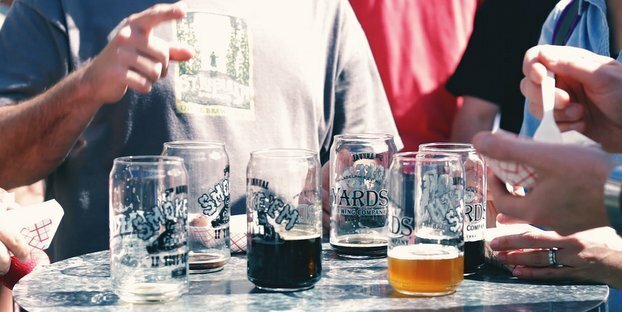 It gives people a special opportunity to taste a beer they might not have had before and a fun opportunity for them to experience what Yards Brewing is all about. CBB: How does the brewery go about selecting the right event? Raybould: It needs to have a good sense of its brand. If it does, selecting the right events will be easy. Either they fit with our values, personality and standards for quality as a brand or they don’t. If you’re hosting the event yourself, optimize for a fun experience. CBB: What “return on investment” can a brewery expect after attending or hosting an event? Raybould: A brewery needs a community of supporters to thrive, and hosting events could be the difference between having one and not. That said, if your goal from your event is marketing, the results of that marketing are currently pretty hard to measure. The feedback you get is pretty anecdotal. What we do when we have an event is tally up the buzz it generated online as a proxy for how much buzz it generated overall. For example, an event we threw a couple months ago had 10 attendees, 20 shares on Instagram and Twitter, and 200 likes or favorites from other people. That’s a lot of buzz – much more than we get from a blog post. Kehoe: For us, success is just getting people more familiar and engaged with our brand. Seeing people coming back to the same events every year – and bringing their buddies with them – is a great validation of our efforts. We don’t attach a monetary figure to our events; in fact, we just hope to break even. It’s more about getting people to experience the Yards brand and saying thank you to our current customers. CBB: Can you give us a few examples of what you consider to be extremely successful Yards-hosted events? What makes them successful? Kehoe: We do a few different annual events at Yards. We recently hosted the sixth annual “Smoke ‘Em If Yous Got ‘Em” event. It’s an amateur BBQ and smoked meat competition where we also serve up 30 craft beers from around the world – most of them smoked. We also have live music. Another annual event we do is called Philadelphia Real Ale Invitational to celebrate cask ale (we actually helped resurrect this unique brewing method in Philly 20 years ago with our award-winning ESA). We had 30+ of the finest cask ale producers join us for our 6th consecutive event earlier this year. We also do a fundraiser event called the Pynk Affair that showcases our tart berry ale and raises money for breast cancer. 1. We really try to keep the event size manageable. We try to cap our larger events around 300+ people – anything more than that and people start having to deal with long beer and food lines which nobody likes! 2. We try to host events that have fun themes that will get us excited and will also attract a fun crowd of folks. For example, we love BBQ, so we get super excited for our smoked BBQ event. Same thing with our cask ale event. CBB: What should a brewery think about before deciding to run it’s own event? Raybould: Not much – just do it! You have a venue, just start small and test out the event waters. Come up with an idea for an event that is a fun time, and make it happen! Kehoe: My biggest advice for breweries looking to put on their own event is to over prepare and then to have fun! CBB: What are the most commonly overlooked aspects of putting on a brewery-centric event? Raybould: If you’re including yourself in an event put together by someone else, they probably don’t have a good grasp on local liquor laws. So, make sure you educate them. CBB: What are a few product promotion ideas for breweries attending an event with other brewers? How does this differ from an event the brewery puts on itself? Kehoe: The craft beer community is a very tight-knit group. We are very supportive of each other and really try to make sure other brewers have fun at our events, too. For example, we do all the work for them – pour all their beer, etc. so they can have fun. We’ll sometimes do giveaways for customers with certain brewers, or other brewers will give away tickets to our big events.